As with brick shapes, today’s designer has a multitude of brick sizes to work with. 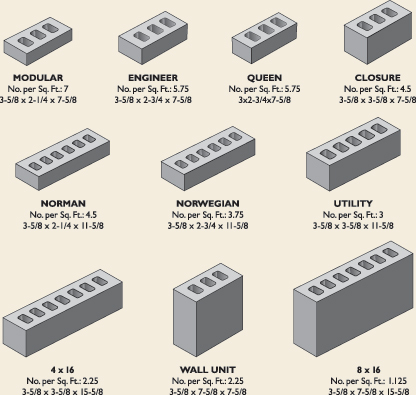 Some of the more common sizes used in the New England area include; Modular ( 2-1/4” x 7-5/8”), Economy (3-5/8” x 7-5/8”) , and Utility (3-5/8” x 11-5/8”). Use of different brick sizes on the same project gives the ability to play with colors, textures, and bond patterns to achieve a custom look at a standard brick price. Some of today’s trends include using larger brick sizes to make projects more economical. As a general rule, the price for larger brick in a wall is less than that of a smaller brick. Just like the standard modular brick, manufacturers are also producing brick shapes in larger sizes to complement a larger brick size. Please contact Mack Brick for availability of larger sizes and brick shapes.